Hey Pool owners, let’s talk about pool plumbing, more specifically about how your plumbing may be affecting your pump’s ability to prime. Your pool pump, aka the heart of your pool, has the job of circulating water throughout your entire pool system. The Total Dynamic Head (TDH) of your plumbing, measured in feet, is the total equivalent height that water must be pumped while taking into account friction losses in the pipe. 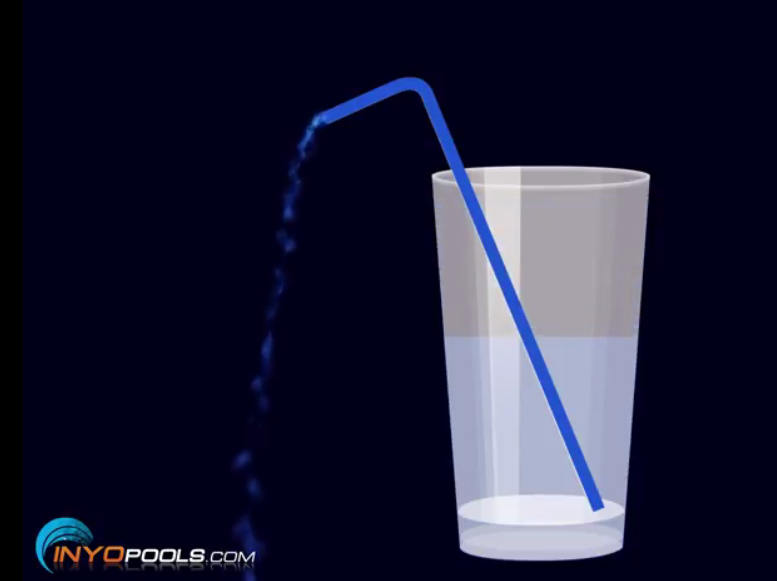 To keep things simple, TDH is a number that we use to figure out how hard your pool pump has to work to circulate water. 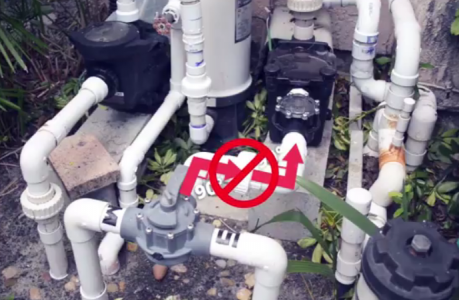 The higher the TDH is in your pool system, the harder your pump has to work. 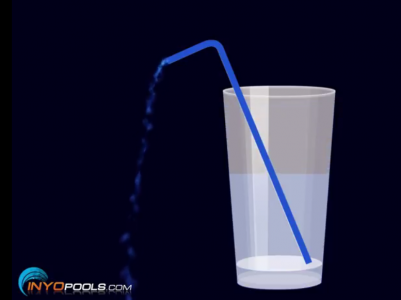 Take a look at this drinking straw for an example. A person shouldn’t have any problems drinking through this straw. 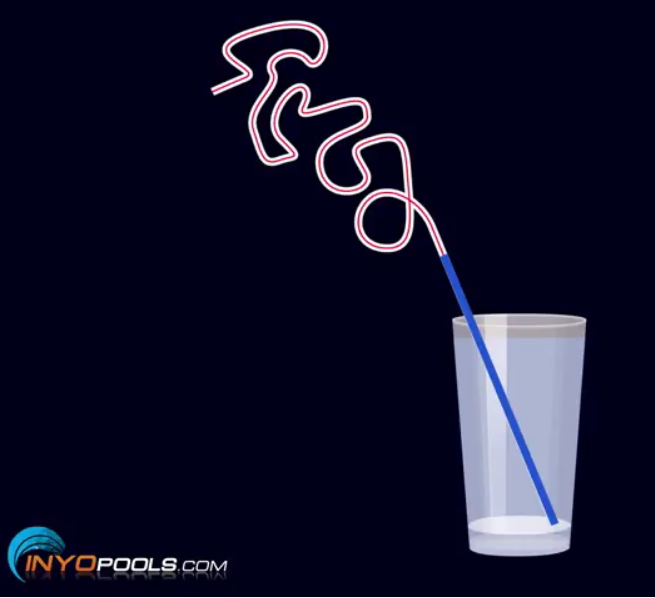 Now let’s increase the Total dynamic head by adding to the length of the straw, and by introducing multiple bends and turns. One would find it very difficult if not impossible to drink through this straw. The same applies in pool plumbing. If the TDH is too high, your pump could have trouble priming. A factor that commonly causes high TDH is a large number of 90° degree turns within your plumbing, especially near the inlet of your pump. 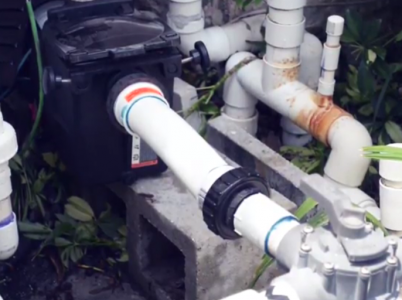 These can often add several extra feet to your TDH, and having one too many turns can sometimes be the cause of your pool pump not being able to prime. Let’s take a look at real world example of this happening and how we solved the problem. The pool we worked on had a pump that was taking too long to prime. After evaluating the plumbing, we found two 90° degree turns and a check valve right in front of the pump. These back to back turns are very costly when it comes to Total Dynamic Head and should always be avoided when plumbing in pool equipment. The best solution to this problem was to cut out the complicated mess of 90° degree turns along with the check valve, and replace it with a simple flex pipe running straight into the pump. We had to slightly adjust the pump placement to get everything to line up, but the end results were drastic. The pump was now able to prime very quickly compared to the old configuration. If you think your pump is having trouble priming due to complex or poor plumbing, we highly recommend that you evaluate your pool plumbing situation and determine if there are too many 90° degree turns that could be causing a problem. Remember, best results are achieved when the plumbing that leads into the pump is as straight as possible. We recommend having anywhere from 1 to 2 feet of straight pipe leading into the pump inlet port. It’s beneficial to use the largest diameter possible when replacing pipe in order to allow greater water flow to your pump. Visit our blog for information on how to calculate Total dynamic Head in your swimming pool, and If you decide to undertake this project yourselves, leave a comment down below and let us know the results. If you have any questions regarding this topic or anything else related to pools, visit us over at Inyopools.com, and check out our new Forum where pool owners can interact and engage in pool related discussions. Thanks for watching and we’ll see you next time! I think I have a leak somewhere. I fill your the mark on the skimmer or above and the next day it is an inch below the mark. Where could it be going? I don’t notice the ground excessively wet anywhere. Is this an inground or above ground pool? Is there an ideal range in seconds of time should take to prime and push air out? There is no set priming time for a pump; there are times you want and ways to improve priming time, but priming can vary on each pool. The time it takes to prime a pump is dependent upon how much air is in the system and the feet of head; this period could be a few second up to a minute or more. the problem is that now the pump will nit prime and the water in the strainer basket area dumps back into the pool through the skimmer and main on the bottom. any suggestions as to fix this and get the pump water to prime? 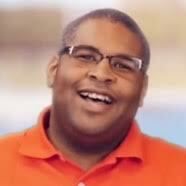 Poolside Chat Episode #36: Is there a Minimum Filter Pressure (PSI)?